Bethany (?) married Harry Houghton. Alice Esenberg Ball married third Frederick Louis Houghton age 59, 3rd mar on Oct 2, 1907 at Bennington, Bennington Co., VT, USA. Margaret Elnor Manning married Artemus Nelson Houghton, son of Wendell Houghton and Anna Grover, in Oct 12, 1915 at Guilford, VT, USA. Arthur Ainslie Houghton married Helen Ursrey. Verna Harriet Merrill married Earl Ainslie Houghton, son of Melvin Jason Houghton and Nellie Almira Hutchinson, in Sep 17, 1918 at Woodstock, Windsor Co., VT, USA. Mildred Mae Shepard married Freeman John Houghton, son of Albert John Houghton and Genevieve Ormsby, in Jun 21, 1916 at Hardwick, VT, USA. Mae Joanna Houghton married George J. Bradis in Oct 2, 1940 at Hardwick, VT, USA, age 22. Charles Jonathan Houghton married Ruth Phyllis Holland in Oct 6, 1934 at Burlington, Chittenden Co., VT, USA, he age 32. May A. (?) married Charles A. Hogdon. Ida Mae Heath married Charles Whitcher Houghton, son of Leonard Oliver Houghton and Jennie Mary Whitcher, in May 6, 1903 at Cabot, Washington Co., VT, USA, age 23. Raymond Leonard Houghton married Doris Julia Phelps in Nov 26, 1924 at Marshfield, VT, USA, age 21 and 17. 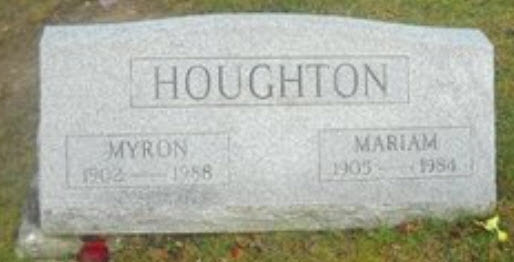 Myron William Houghton married Mariam Frances Wood in Aug 3, 1940 at Bennington, Bennington Co., VT, USA, age 38. 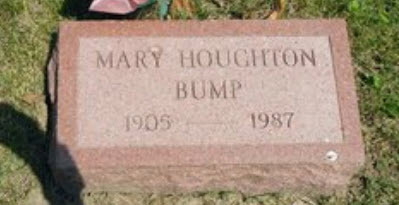 Mary Electa Houghton married Clayton Owen Wilbur in Oct 18, 1941 at Bennington, Bennington Co., VT, USA, age 35. Mary Electa Houghton married Carl Bump. Guy Wayland Green married Ella Mae Houghton, daughter of Darius Erastus Houghton and Addie Jane Walker, in Dec 15, 1915 at Bakersfield, Franklin Co., VT, USA, age 27. Donald Edward Houghton married Rose Ethel Vose, daughter of (?) Harvey, in Sep 2, 1916 at Rockingham, VT, USA.